SANCA founder Jo Montgomery teaches German Wheel to a student who has spina bifida. SANCA’s senior-most student, Joan, shares her love of unicycle. She is a huge inspiration to adults who are afraid they might be “too old” for circus. Youth from Refugee Women’s Alliance, a SANCA Social Circus program partner, learn the basics of partner acrobatics while also developing social skills including trust and cooperation. The School of Acrobatics & New Circus Arts (SANCA) is home to people of every age and skill level looking for holistic ways to express themselves physically through circus arts. SANCA was founded in 2004 by Jo Montgomery and Chuck Johnson “to improve the mental, emotional, and physical health of children of all ages, backgrounds, and abilities.” SANCA’s educational, recreational, therapeutic, and performance-based circus programs offer experiences that are physically challenging, socially enriching, and encourage creative participation in the arts—from beginners just learning to work with their bodies to professionals launching careers in the circus arts. SANCA’s Youth Scholarship and Social Circus programs provide free access to more than 700 youth annually from many vulnerable communities. 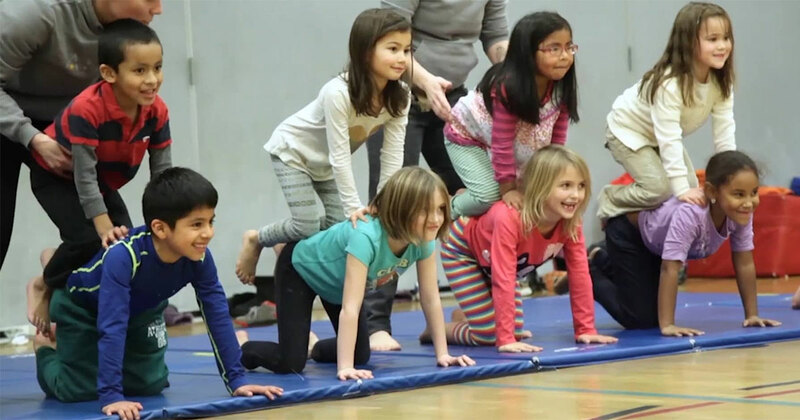 Its adaptive-circus classes make circus arts available to people with physical and emotional challenges, and empower youth and adults alike by promoting trust and cooperation, increasing confidence, and promoting play. SANCA’s philosophy is to meet each student where they are, taking into account their life experiences, goals, and dreams.